Above picture: Doc T 120 feet down on a wrecked ship in the Atlantic off the coast of Palm Beach, FL. I held onto the rope at 15 feet as I looked at the end disappear into the darkening water below me. A faint outline of the huge vessel seen 100 feet below me, barley visible, reminded me of the fish and sponges I had recently visited. My son and I were completing a dive on a purposefully sunken ship that was slowly becoming a new habitat for marine life in the area. We had maxed out our bottom time and I was holding at 15 feet for the mandatory decompression stop. Let me explain to all the horsemen who never have stuck their heads under water a little bit of physics. Then I’ll tell you the importance of this day in my life with horses. When you dive to 33 feet under salt water, the pressure on your body increases to double of what you feel right now at the surface of the planet. At 66 feet it is 3 times and 99 feet, it is 4 times the pressure. We had completed our dive to 120 feet or 5 times the pressure on our bodies. What prevents us from being crushed like a can under a tire is the fact that everything inside us is filled with air at the same pressure and that pushes back out and prevents us from being crushed. Imagine a large plastic soda bottle filled with air and sealed. As you go deeper in the water, the bottle becomes crushed from the weight of the water around it compressing the air inside it. Hang in there – the physics lesson is almost over. If we fill the plastic bottle with air while it is 120 feet underwater and restored the shape of it, everything looks good. That is what happens when we breath air from the tanks under water. As we rise to the surface, the air both in the filled bottle and in our arteries and veins starts to expand. The plastic bottle will actually explode as the air expands. The expanding air in our bodies will actually damage our lungs, our joints, and even kill us if we don’t stop regularly and breath for a few minutes while holding our depth to let the expanded air out of our system. Today the current was as fast as slow moving traffic on the interstate. I checked my depth gauge and held tightly to the rope as the current propelled my body straight away from the rope like a flag in a stiff breeze. My fingers squeezed tightly and I struggled to keep my body from flipping about. The time ticked slowly away and I started to doubt my ability to stay where I was. Then my eye caught an amazing sight. 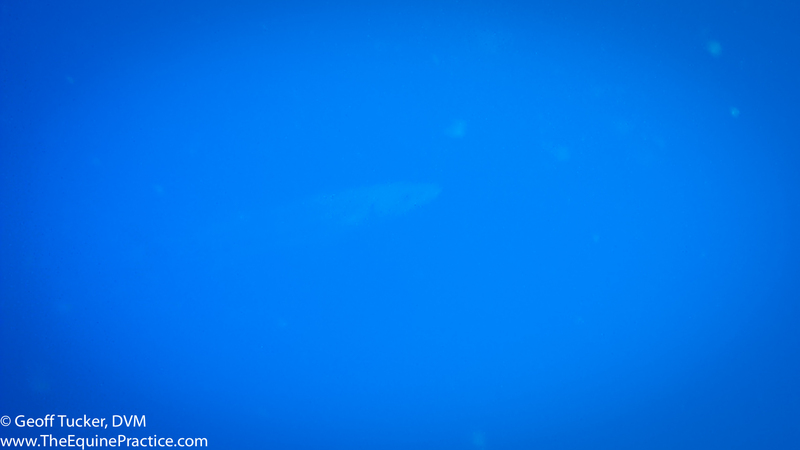 Look closely in the center of this picture and you will see the Barracuda looking to the right that lazily hung out with me as I struggled to keep my position still at the decompression stop. Directly in front of me about 10 feet away was a fish looking back at me. A rectangular profile with two eyes without emotion and very sharp teeth protruding from the lower jaw. Barracuda! He was motionless. Then he slowly moved sideways and his 4 foot body glistened in the sunlight filtering from above. With regular movement, his small pectoral fins adjusted his trim and direction, but the rest of his body was almost motionless. It was comical to see the Barracuda gently keeping his position as I struggled desperately against the stiff current with my white knuckled grip keeping me from rocketing away to a location a mile away from the boat above. “How did he do it?” I asked myself. His minimal effort was achieving the maximum results for this evolved aquatic animal in the middle of the ocean. I became fascinated with the efforts we as horsemen use when working with horses. In our dentistry school as well as with the horse owners we go to, we often hear people say, “You make it look so easy.” This is when I think about the Barracuda on that day. He made it look so easy because he was born in it and did it every moment of his life. Melissa here makes floating teeth look so easy on this warmblood. Truly an outlier, she is rapidly approaching her 10,000th float. Melissa is near her 10,000th float and I am approaching 63,000. To reach these total, we work on 10 horses a day, every day of the year. This is why it has become effortless for us to walk into a stall of a horse we have never met, and within 30 seconds, place a steel file inside their mouth and file away the sharp points. It is called practice. For all of you who are trying to become effortless with your horse, just do more. Become a fish in the ocean constantly working with the current, not struggling against it. Ride more. Find other horses to work around. Immerse yourself with passion into your life with horses and enjoy the daily improvement you will discover. And if you get a chance, read the book “Outliers: The Story Of Success” by Malcolm Gladwell. Melissa and I are Outliers in equine dentistry. Let’s all become Outliers with our horses. It is where true horsemanship lies.